Winter desiccation damage occurs when the amount of water lost through foliage exceeds the plant’s ability to take up water through the roots. Exposure to winter wind and sun increases the rate of water lost through transpiration, robbing the plant of essential leaf moisture needed for survival. LeafShield provides safe and effective protection against desiccation injury. It forms a protective barrier that seals leaf stomata to reduce moisture loss. LeafShield dries to a thin, waxy layer that protects foliage without discoloration. It is safe to use on all plant types, including blue spruce and other sensitive varieties. 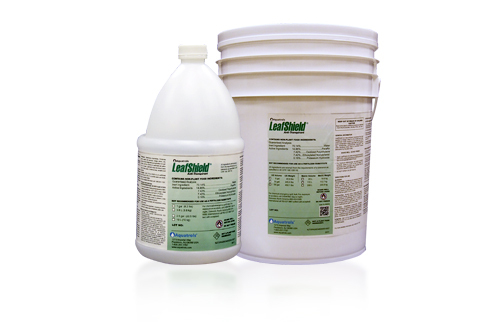 LeafShield’s odorless, non-sticky formulation mixes easily with water. It washes effortlessly out of spray equipment with soap and water so cleanup is a breeze. It can be applied in sunny or cloudy conditions, further increasing ease of use. Costs less than similar products. Protects turf against desiccation injury. Safe for use on all turf and plant types. Stays flexible and will not discolor foliage. Will not clog nozzles or damage sprayer pump seals. Economical enough for fairway protection. For more information about LeafShield, including pricing and availability, contact your local Aquatrols distributor today!